I’ve found that I can be slipshod about lubricating items. Doing some more often than called for and other less often. So here is my attempt to organize maintenance tasks by how often they should be done with the goal that I am more consistent in servicing the car. The nifty lubrication chart in the 1933 DeLuxe Plymouth Six Instruction Book is oriented around the location on the car, not the frequency of required operations. There are non-lubrication maintenance items scattered through the manual. Finally, there are some items that aren’t mentioned at all but are listed in factory service manuals for slightly later models. Modern multi-viscosity lubricants perform well over a wider range of temperatures than those originally available. These service intervals may be cautious as modern lubricants and materials are far better than those originally available. Check engine oil level. Fill to proper level. Turn down grease cup on distributor one turn. As required refill with short fibre grease — medium. Steering spindle (king pins) (4 places) (semi-fluid chassis lubricant). Tie rod ball joint (2 places) (semi-fluid chassis lubricant). Drag link ball joint (2 places) (semi-fluid chassis lubricant). Front spring shackles (4 places) (semi-fluid chassis lubricant). Battery. Check and add distilled water as required. Rear spring shackles (4 places) (semi-fluid chassis lubricant). Air cleaner. Remove, wash in gasoline, re-oil with 50 wt engine oil. Oil filler cap. Remove, wash in gasoline, re-oil with 50 wt engine oil. Starting motor oil cup (1 place) (engine oil). Pedal shaft felt and brake pedal connection. Oil hole and linkage (engine oil). Battery terminals. Clean and coat with Vasoline. 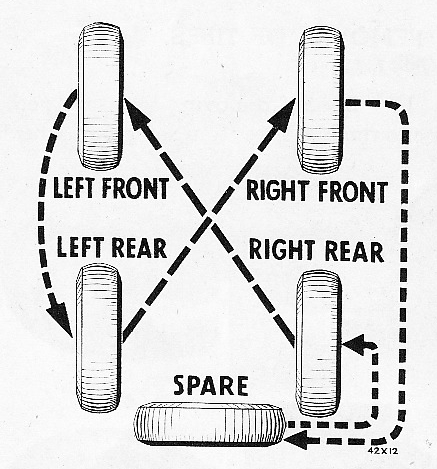 Rear axle shaft bearings (2 places) (short fibre wheel bearing grease — medium). Clutch release bearing (1 place) (short fibre wheel bearing grease — medium). Universal joints. (Universal joint or fibre grease). Note 1: 1933 Instruction Book calls for semi-fluid chassis lubricant while the 1934 Factory Service Manual emphasizes using only water pump grease. Note 2: Manual calls for 1,000 miles in winter and 1500 in summer but rather than create another service interval am grouping the oil change into the 2,000 mile service. With cleaner road and modern detergent oil can probably do this at the 2,000 service instead of the 1,000 mile service. Note 3: 1936-42 Factory service manual calls for tire rotation at 2,500 miles, but rather than create a whole new service interval putting it at 2,000 miles. Rotation pattern shown in manual differs from that typically found on Internet and is reproduced here. 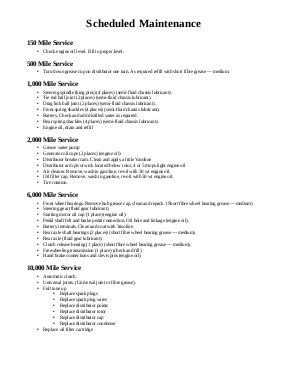 Note 4: Manual calls for these items to be performed at 6,000 mile intervals but glancing at the odometer and determining if the service due is easier with 5,000 mile service intervals. Note 5: Instruction book calls for 30,000 mile replacement of spark plug wires and no mileage is given for replacement of points, rotor, cap and condenser. But given the fact that spark plug replacement is suggested at 10,000 miles, and personal experience with points type ignition systems, decided that full ignition tune up should happen about this mileage. Note 6: Instruction book calls for seasonal change but assumes using alcohol based anti-freeze in winter and water with rust inhibitor in summer. Using a 50/50 mix of ethylene glycol based anti-freeze and water, recommended replacement intervals for new cars seems to be every couple of years or 30,000 miles. Given an average distance I drive in the 1933 Plymouth putting this in the 10,000 mile service means it should get done every 2 to 3 years.